Team BlackBerry: show some support for BlackBerry Customer Support! If you follow us on Twitter®, you may have seen that @BlackBerryHelp, the official Twitter account of the Inside BlackBerry® Help blog and the BlackBerry Customer Support team, has been nominated for a Shorty Award! For those of you unfamiliar with the Shorty Awards, they’re online awards that highlight the best companies and individuals across social media, complete with a big ceremony to recognize the winners! Twitter users in particular can nominate their fellow tweeps for awards based upon excellence in tweeting over the past year. So far #TeamBlackBerry has helped catapulted @BlackBerryHelp to 1st place for the Shorty Award in the best customer service category. Has @BlackBerryHelp ever helped you get out of a bind or troubleshoot a problem? Then support @BlackBerryHelp by following these easy steps to cast your vote! 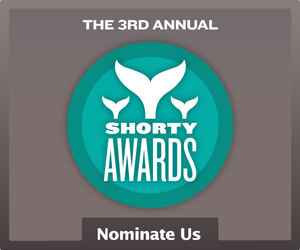 The Shorty Award nomination period closes on Friday January 28th Tuesday February 11. Thank you all for your support! If you’re interested in learning more about the @BlackBerryHelp Twitter team, check out the Shorty Interview.